When a child complains about tooth or mouth pain, parents will quickly do a visual check for the telltale signs of a cavity. However, when it comes to an infected tooth, it’s sometimes difficult to spot. When and if you do find signs of infection, what exactly do you do if your child has a tooth infection? If you see any of these when checking your child for mouth pain, be sure to make an appointment with a pediatric dentist immediately, and be sure to communicate the symptoms you’re seeing in your child. An abscessed tooth needs to be treated by a dentist right away. If left untreated, the bacterial infection can actually spread beyond the mouth to other parts of the body with more severe consequences. If your child has a facial swelling, (and you think it is from a decayed tooth) it is very serious and you must call your pediatric dentist immediately or go directly to the emergency room. The pediatric dentist will prescribe and antibiotic for a dental abscess (if the tooth isn’t treated right away) and/or facial swelling. The baby tooth that is the source of the infection is the tooth that will have to be removed. Depending on the child’s age, a space maintainer may need to be placed in order to hold that space for the adult tooth to come in. Once the tooth is removed, the socket is open and the infection can drain out, since infections take the path of least resistance. It is important that if an antibiotic is prescribed that the child finish it, even if the tooth had already been removed. Your pediatric dentist will provide you with instructions on how to treat and monitor your child after their treatment. Home pain treatment may include cold compresses will reduce swelling, sticking to soft foods while your child is still numb, washing the mouth with warm salt water rinses, no sucking through straws because that can pull the clot off, no spicy or acidic foods because that could irritate the healing gums, and alternating Tylenol and Motrin every three hours helps keep your child comfortable. 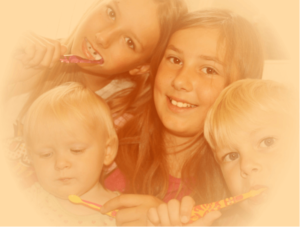 There are situations that despite a parent’s best efforts, tooth decay and infection happen. However, it’s still critical to follow best practices on how to prevent tooth decay in kids’ teeth including brushing at least twice a day, limiting sugary snacks, and seeing a pediatric dentist on a regular basis so we can prevent any issues, and if issue do arise, they are caught and treated early.